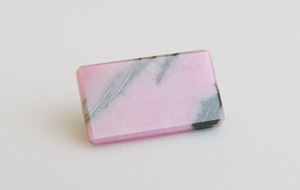 A finegrained quartzite-like rhodonite enriched by manganese and low contents of iron and magnesium. Usually of metasomatic origin (manganese skarns). Ornamental stone, in which besides it black dendrites and veins of manganese hydroxides and oxides, brown sections of bustamite and other inclusions occur, giving a polished surface very nice and interesting look. 1 specimen: 0741 — 2.55 ct, Russia, Ural Federal District, Sverdlovsk Oblast, Sysertsky District, Middle Urals, Malosedel’nikovskoe deposit, 56.646111°N 60.740278°E.